The Equus is one of the Creatures in ARK: Survival Evolved. Horse and man have long been partners in survival, and this remains true on the Island. In Equus, survivors will find a trusty steed or pack animal that can carry them swiftly across land. Taming an Equus has proven interesting, requiring carefully approaching the creature in the wild, mounting it, and then carefully soothing over time by feeding it vegetables. In fact, Equus' reliability has lead some survivors to construct special saddles for them. I even encountered a man who added extra saddle-pouches that doubled as mobile crafting stations for chemical supplies, foodstuffs, and other items. Although not as robust as what you might find within a village, this utility helped him live a nomadic, solitary lifestyle. Some survivors employ Equus to herd and wrangle other creatures with a specialized lasso. This tool is sometimes effective for self-defense as well, as Equus is limited in battle on its own...at least compared to aggressive prehistoric carnivores. The Equus will trot around the island and poses no threat to any survivors. If a player gets near one, they will flee. If you wish to get near one to tame, use a Ghillie Suit. The Equus appears like a mixture of zebra and a large modern breed of domestic horse. 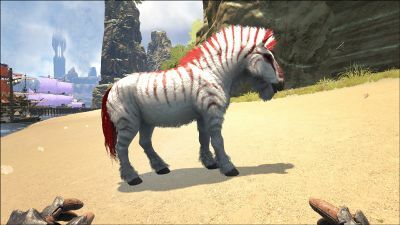 It has a long wild mane, zebra like stripes, a tail like a horse and a shaggy beard like a goat's. From the dossier it appears to be comparable to larger horse breeds in terms of size, such as the Shire horse. This section displays the Equus's natural colors and regions. 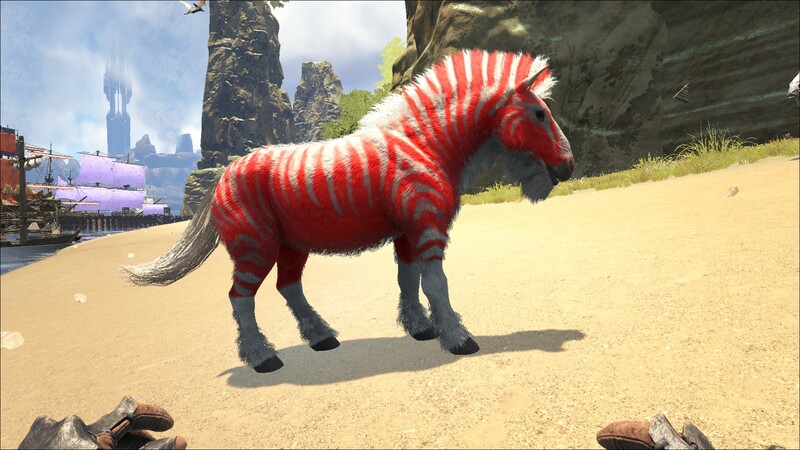 For demonstration, the regions below are colored red over an albino Equus. The colored squares shown underneath each region's description are the colors that the Equus will randomly spawn with to provide an overall range of its natural color scheme. Hover your cursor over a color to display its name and ID. For example, "cheat SetTargetDinoColor 0 6" would color the Equus's "body" magenta. The Unicorn is a variant of the Equus distinguished by its white coloring and the horn protruding from its forehead. Only one wild Unicorn may exist at a time. Once tamed, another Unicorn may spawn in its place, as the tamed Unicorns no longer block wild spawns. Players can utilize cross server transfer to find other Unicorns to breed with. They can be transferred to Aberration maps as well. Unicorns can breed with other Unicorns, but they can not breed with an Equus. In ARK: Survival Evolved Mobile, the Unicorn has some noticeable differences. The Equus is a useful early game tame. It's fast and deals torpor with its buck attack so you can tame other creatures early game. Equus are a passive creature that when startled, will attempt to flee. Bolas and any kind of ranged/short range weapon is effective at stopping and killing them along with most tames. Bolas are effective against the Equus. Mostly every other weapon is also effective. The Equus itself doesn't appear to present any immediate threat. Predators nearby are your biggest worry, as focusing on the tame or kill may distract you from your surroundings. If you attempt at taming it, it may kick you and set your torpor immediately at 50%, leaving you unable to defend yourself against nearby predators around. The Equus may pose a threat in PVP as it can quickly transport your enemy, and deal torpor to you, possibly knocking you out. In ARK: Survival Evolved Mobile, the Equus is tamed with Kibble (Dilo Egg). Begin by sneaking up on the Equus - they will flee if you startle them, much like the Tapejara. A ghillie suit will greatly aid in this endeavor. Place its preferred food in the last slot of your action bar, and when close enough, press e to feed. You are then able to press e again to mount the Equus. It will begin to run with you on its back, so be aware of any potential threats in the area prior to beginning the tame. While riding, watch for when it begins to buck and attempt to throw you off. Press e again to feed and calm the Equus. If you do not hit the feed button fast enough you will be thrown off the Equus, which will then kick you to inflict torpor damage. Repeat this process until you have your very own noble steed. Make sure to only feed the Equus when it starts bucking. If you feed it prior, then it will throw you off it’s back and your taming progress will be lowered. You may jump while riding the Equus, so you may do this until it runs out of stamina, effectively making it slower. While taming, you must be defensive against other creatures, so go in prepared. Have other tames and tribe members on aggressive and follow, and it may also be worth walling off the area that the Equus is in (in an effort to minimize the predators in the area). Sometimes if another creature hits the Equus during taming, the taming progress drops to 0%, and taming efficiency is penalized as well. Another good strategy is to pick up the Equus with an Argentavis or Quetzal and drop it in a trap, as the regions they spawn in are relatively dangerous. Every time you botch the taming process you will lose taming effectiveness. It is possible to reset the effectiveness to 100% by knocking the Equus unconscious - however they might despawn at some point after - this even while taming it. Knocking-out: The Equus can be used to knock out other creatures using the secondary attack. Scales with Melee damage. (default: rmb). Mobile Crafting: Their saddle acts as a Mortar and Pestle similar to Castoroides and Thorny Dragon with Smithy. Trapper: The saddle allows making Lassos, which can be thrown at creatures to tether them to you. You can then move where you want. Gatherer: the Equus can gather berries by attacking bushes or small trees. Racing Mount: In ARK: Survival Evolved Mobile, the Equus comes with a stat known as Equus Power. Equus Power determines the speed and stamina of the Equus for racing. It can also be bred for the chance to attain one of six racing classes. These are Lazy (0-1.99), Normal (2.00-3.09), Swift (3.10-4.50), Maiden (4.51 - 6.64), Racing (6.65 - 13.32), and Thoroughbred (13.33). Dino Dossier revealed on 1/9/2017. Equus can be ridden with or without the saddle.